In Mick's spot-on review of Zhrine's Unortheta the other day, he talked about the genre descriptor "atmospheric" more often than not being applied to black metal bands. Lo and behold, I bring to you today a review of such a band! I'm not sure what it is that makes me go so crazy for well-done atmospheric or folk metal, but throw some acoustic guitar or ambient sound between some blast beats and snarled vocals, and I'm all in. And with the demise of Agalloch not too long ago, I've been looking for some good ol' American folk/black ambiance with which to fill my day. Lucky for me, Denver, Colorado's Wayfarer has stepped forward with their sophomore album Old Souls, and it's exactly what the musical doctor ordered. Wayfarer's debut album, 2014's Children of the Iron Age completely escaped my attention; after listening to Old Souls, I plan on rectifying that immediately. So while I can't compare Old Souls to Wayfarer's other album, I can compare it to other albums of its genre, and suffice it to say, it comes out ahead. Wayfarer is a four-piece made up of guitarists Shane McCarthy and Tanner Rezabek, bassist James Hansen (the three share vocal duties), and drummer Isaac Faulk, and each shines brightly on Old Souls. Faulk, especially is a standout; his drumming on interlude-track "Frontiers" is my favorite part of the album. (Side note: As a Rams fan growing up in St. Louis during the "Greatest Show on Turf" era, the name "Isaac Faulk" makes me ridiculously giddy). Like many metal albums, Old Souls runs together well enough that it can and should be listened to as one piece of music. "Ever Climbing" is a great opener, leading off with a doomy feel that the album unfortunately doesn't revisit before Faulk's drums kick up and the band roars into a ferocious black metal assault. The aforementioned "Frontiers" is a terrific instrumental passage that leads into "Old Souls' New Dawn," which uses acoustic guitar to wondrous effect in between the black metal passages. I have no doubt that Wayfarer could pull a Nest or a Steve von Till and make a completely acoustic album that would be harder, darker, and better than many of their contemporaries. "Catcher" is probably the most straight-forward black metal song on the album, while "Deathless Tundra" is just terrific. It does all the things the rest of the album does, but the way it happens is truly a "WOW!" moment. An eight-minute "WOW!" moment, to boot. "The Dust Lakes" makes the most of its four and a half minutes, an instrumental track that bends and shifts and elevates out of the sound of the rest of Old Souls. Album closer "All Lost in Endless Chaos" begins with a Krallice-like intensity, before moving to a stripped-down guitar and drums interlude. This pattern repeats itself over the length of the song, before moving toward an aggressive and satisfying close. Old Soul's strength lies in its pacing; it doesn't wallow so long in ambiance that you forget it's a black metal album, and it doesn't spend too long in solely black metal territory either. 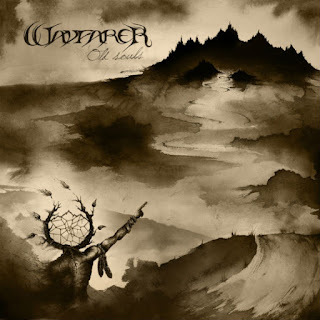 Wayfarer doesn't reinvent the genre, or turn the tropes on their heads, with Old Souls, but it excels within the band's chosen parameters and highlights what atmospheric black metal can be when done well. In a genre that's become wildly oversaturated with clones and worship, that's pretty compelling.